Many organizations that are running SharePoint 2003/2007 or other CMS are either actively considering or in the midst of upgrading to SharePoint 2010. In this blog we will look at what is involved in upgrading to SharePoint 2010, various options available for the upgrade, and initial planning that needs to precede the migration. It is much easier to migrate a clean and lean environment than an environment that is full of obsolete content, unused features and broken customization. Start with cleaning up your existing sites and check for the orphaned sites, lists, web parts, etc. Remove any content that is no longer in use, remove unused features and ensure used features are present and working. 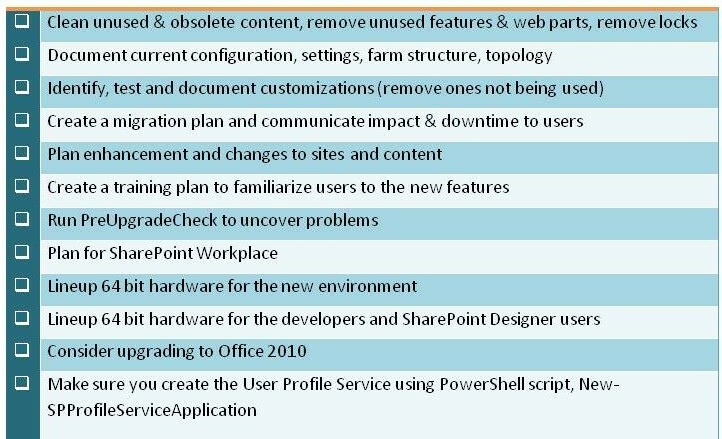 Once your existing SharePoint site is in tiptop shape you are ready to plan your migration steps. Can you afford to put your environment in read-only mode for the duration of the upgrade? Does the amount of content you have make it prohibitive to copy it over the network? Do you have a lot of customization that you have to deal with? 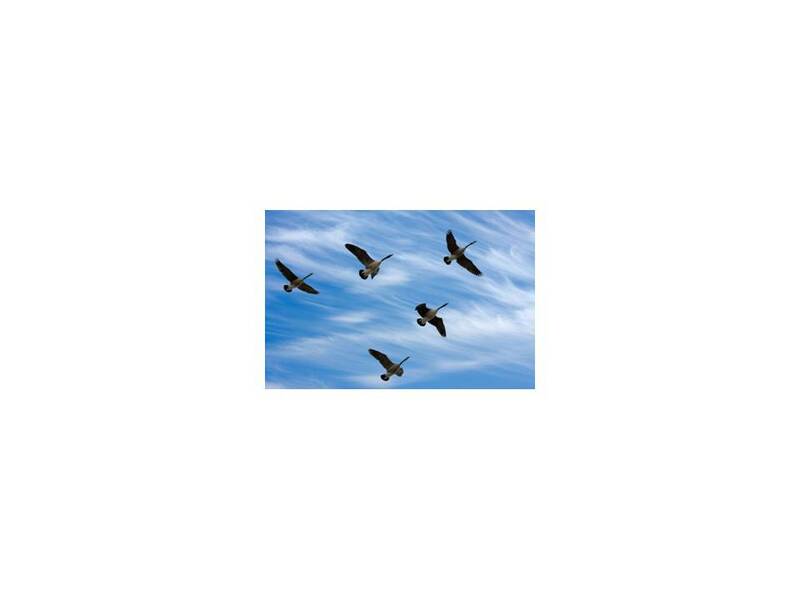 Are you planning to reorganize or selectively migrate your content? The answers to these kinds of questions will direct your choice of migration tools. Here is a check list that will help you get organized. Customizations can have a big impact on how quickly and smoothly your migration goes. Therefore it is important to identify and account for as many of them as possible. PreUpgradeCheck can help but here is a list to help you identify and uncover customizations that can add complexity to your migration efforts. Sometime ago I read an article about the top ten ways to destroy the earth. Although it is a bit morbid to even think about such a topic let alone compile a top ten list, it certainly is an interesting scientific problem. Blow ing planet earth to bits is not as simple as it may seem. It takes considerable amount of energy to blow up six sextillion tons of rock and metal. However, there are some exotic ways to get the job done. From creating a micro black-hole on the surface of the earth to creating an anti-matter bomb with 2.5 trillion tons of anti-matter to creating perfect Von Neumann machines (self-replicating), they are all pretty futuristic and not part of our everyday experience. Some may say- “why even think about such an absurd subject?”, but it does have few practical applications. If nothing else, it helps us think about possible dangers to the only known planet capable of supporting life. The Missing Matter—Requirements: Lack of business and functional requirements or requirements lacking appropriate level of detail. Progress Black Hole: Lack of mechanisms to measure progress, milestones, and deadlines. Caught in the Gravitational Pull of Technology: Focus on technology itself rather than achieving business objectives through technology. Supernova – Out of Resources: Unrealistic expectations and deadlines – trying to achieve too much in too little time and with too few resources. Consumed by Nebulous Clouds: Constantly changing requirements and feature creep. Inability to give the project and product a solid shape and direction. Lack of proper change control process. Bombarded by Asteroids: Loss of focus and progress due to multi-tasking on unnecessary side projects and other distractions. Lost in Space: Lack of a well defined project plan with appropriate level of details, milestones, and resource allocations. Too many WIMPS (Weakly Interacting Massive Particles): Lack of interaction with the business users, lack of sufficient number of check points, lack of business user involvement during the planning, build, and deployment phases. Journey to the Edge of the Universe: Attempting to run a project with bleeding edge technology, inexperienced project team, and poorly understood business objectives. Starless Solar System: Lack of clear and convincing business case and mapping of how the project will help to achieve the business objectives. In today’s economic climate justifying the cost and benefits of an IT initiative has become more important than ever. Often the fate of an IT project depends on the justification of benefits and recuperation of the costs. Therefore calculating, presenting, and demonstrating the benefits of a project in an appropriate manner can make the difference between getting a green light and getting stuck in an endless review cycle. During my interactions with various IT departments I have noticed that the IT staff values a project differently than the business sponsors or executive team. Calculating and communicating the value of an IT project puts the IT staff in an uncomfortable and unfamiliar role which requires financial, sales, and technical skills. Quite often even when the IT staff tries to focus on business benefits they fail to align the benefits of a project to the business concerns in a manner that resonates with the executive team. The use of appropriate terms and prioritization of business concerns is key to grabbing the attention of the business sponsors and the executive team. A value statement [i]can be a useful tool to summarize and contextualize benefits of a project in almost all circumstances. Sometimes there are cases when ROI is not clearly defined, is impossible to define, or simply not that important to the stakeholders. Under such circumstances a value statement can be instrumental or even a must. They help overcome resistance, bind together stakeholders, and focus the project around delivering real business value. To summarize, they help you see the forest from the trees where as ROI calculations help you count the trees. The benefits need to be tied back to the capabilities by linking them to preferably operational measures. Financial measures although are more accurate they typically lag operational measures. The rate of return of the investment is not just returns exceeding the original investment plus the cost of capital but it should also include compensation for the risk of undertaking the project. For example if a project returns 20% and cost of capital is 18% then the additional 2% may not be sufficient justification even for a “sure shot” of a project. As a very rough rule of thumb ROI of less than twice the cost of capital should be considered high-risk. A ROI of 4 times or more of the cost of capital is considered ideal. Capital recovery horizon is the time that a project will need to generate enough benefits to recover the original investment. The rapid pace at which technology, business environment, trends, and preferences change (especially in the IT industry) pose a significant risk of future benefits not being realized. Changing market conditions and new competition can create new more lucrative opportunities as well diminish the value of existing ones. Therefore it is highly desirable to recoup the original investment as quickly as possible to minimize exposure to sudden changes in market conditions. The ideal recovery time can vary significantly and depends significantly on the market conditions and maturity of a given vertical. For fast moving verticals recovery time of 1 to 2 years is ideal. Variance potential portrays the risk associated with changes or variances in the calculations and estimates of the future benefits of a project. Indirect benefits are hard to calculate accurately and are most susceptible to errors and variances. If indirect benefits constitute a high percentage of the overall benefits or a project then the variance potential for the project is high and vice-versa. Indirect benefits that are less than 50% of the overall benefits are ideal whereas a number of 90% or more indicates high risk to the project. Calculating the ROI with appropriate level of rigor can be a daunting task. Coming up with a justification for a project is not a “one size fits all” exercise and does not always have to result in punching numbers and formulas into a spreadsheet. Depending on the type of project and the company the right type of benefits calculation has to be tied to the appropriate level of rigor. Sometimes a clear and well articulated value-statement can be sufficient while at other times you have to have hard numbers to backup your claim. A simplified ROI sheet that ties the benefits to the operational levers (operational capabilities) is presented below. [i] A value statement focus more on the qualitative aspects rather than the quantitative ones, it is simply narrates the benefits without tying it to the bottom-line. [ii] Direct benefits are the ones that are only one step removed or are a direct consequence of the implementation of the project (e.g. hardware/software/staff consolidation, time savings, inventory reductions, increase in revenue, etc.). [iii] Indirect benefits are the sub-consequence of the change brought about the project implementation or are the unquantifiable side-effects (e.g. improvement in morale & good will, more knowledgeable support staff, increase in revenue, etc.). Why do I need to think about assessing the IT capabilities of an acquisition? So you just acquired a company as part of your growth, diversification, or some other strategy. The new company along with its LOB (line of business) expertise comes with an entire IT infrastructure that was thus far responsible for supporting the acquired company’s information needs only. While a great deal of due diligence goes into understanding the viability of the business and its value the same level of rigor is typically not applied to evaluating its IT infrastructure and support staff. In order for the two companies to work together well it is important to understand the capabilities of the two IT infrastructures and how to best integrate or not integrate them. If a detailed and careful plan is not put together to understand the capabilities and assets of the new acquisition you risk inheriting a vulnerability that can spread throughout the larger organization or risk stifling a capability that really should be promoted to the larger organization. Why you need an independent perspective? Sometimes companies use their own internal staff to assess the target or recent acquisition. The problem with this approach is that these assessments can be tainted by hidden agendas, lack of impartiality, and departmental politics. Entrenched interests can also slant information one way or the other as it passes up and down various departmental hierarchies. I was part of a software company which wanted to acquire another software company with similar technology. Our own internal research and development department was tasked with the assessment of the company’s technology. Quite understandably the leaders in the R&D group thought it was inferior to what was developed in-house even though that was far from the reality. The key decision makers involved in the deal, including the CEO and the board of directors, were getting conflicting accounts of the reality and did not know whose version of truth to trust. This is where an independent perspective from external consultants can come in handy. They often face less resistance when digging around and are able to see beyond the personal bias and the “ugly baby” syndrome. A fresh perspective can also help see the forest from the trees which can sometimes be missed by the people who are working on the trees on daily basis. I came across another post acquisition assessment where the management was told that acquired company’s technology and custom developed software was topnotch. Upon further investigation we discovered that the most of the custom software was developed in a little known RAD development environment and less than a handful of people in the company knew how to maintain it. While this creates tremendous job security for some it creates a significant risk for the company. In another situation credit card numbers and all other consumer related information was stored in a database unencrypted! Stories like these are all too common and point to the need for an independent perspective. Is it too late to do an assessment after the deal has been signed? During my days as a consultant I have primarily come across two types of assessments: pre-acquisition and post-acquisition. Pre-acquisition assessments are important where IT infrastructure is a primary part of the value of the business being acquired (software companies, online businesses, etc.). The focus of a pre-acquisition IT due diligence assessment is primarily on ensuring that the IT assets are as good as they have been portrayed, that they are capable of supporting the business objectives associated with the acquisition, and that there are no hidden risks that will require significant expense to remedy after the buyer takes ownership. For example can a wildly successful but local online service be introduced in a new geographic region with a new language, currency, tax and privacy laws, etc? Post-acquisition assessments are important when the prime value of the acquisition is derived from the LOB (e.g. selling insurance policies, financial management, etc.). The focus of this type of assessment is typically ensuring that IT infrastructure is solid enough to continue to support the business; there are no vulnerabilities that can jeopardize the combined entity, finding areas of excellence to propagate, finding redundancies, and figuring out an integration plan. It is always good to get an outside assessment done before the deal is inked however, if that doesn’t happen it is still very important to at least get the post-acquisition assessment and planning done. What kind of acquisitions can benefit from an assessment? These days even small companies whose business does not directly intersect with information technology rely on some sort of back-office IT infrastructure to run their day to day operations. A back-office infrastructure may contain email servers, phone/fax servers, internet gateways, website servers, database servers, LOB applications, etc. A front-office infrastructure may contain client facing applications, online portals, CRM applications, LOB applications, etc. As the number of servers and employees grow the need for proper management and use of sound practices to manage them become more important. 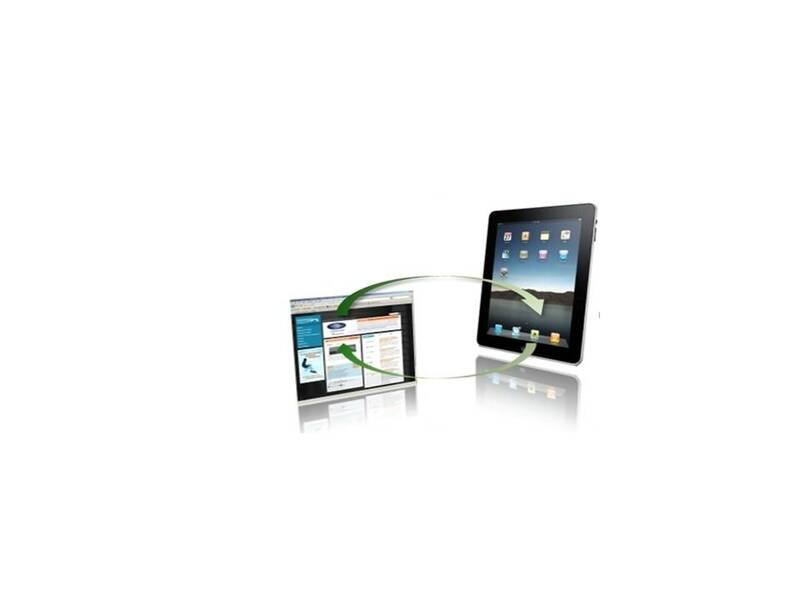 If access to IT infrastructure such as LOB applications, databases, email, website, etc. is essential to the daily operations of your business it is vital to ensure that proper assessment of the potential risks is done and the IT assets are managed properly. What are some of the key aspects that should be examined during an assessment? 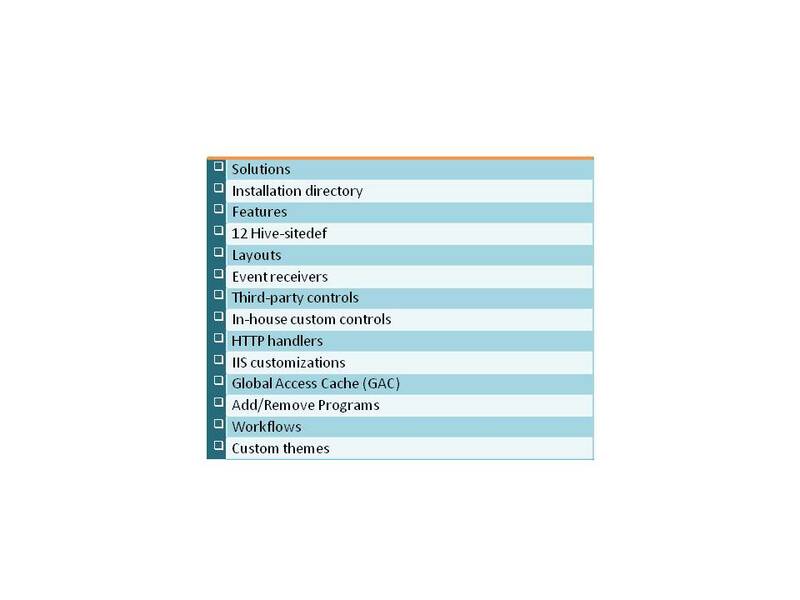 Start with creating an overall blueprint of the IT assets and how they interact with each. You would be surprised to learn how often such a fundamental document does not exist. Look at the hardware/software redundancy needs to provide the needed uptime to the business. Determine what disaster recovery plans exist, when they were last tested, and what kind of situations they can handle. Examine the security risks and ensure that the security practices match or exceed the required level of protection warrant by the business. Does the infrastructure have the capacity meet or exceed the demands placed by the peak loads and growth in the business? Examine the hosting environment for security, redundant power, redundant internet, redundant cooling, proper fire suppression, etc. Ensure that hardware and software assets are not so old that they are longer supported and can’t be upgraded. Is the technology stack compatible with the umbrella company’s technology stack? Are they any strange or esoteric practices or standards that could introduce risk? And never forget to identify practices, technology, and people (centers of excellence) that can benefit the entire organization and should be propagated to the entire company. Reviewing security policies and procedures is another key aspect of the assessment. The risks associated with a weak security structure are obvious and too numerous to describe here. You need to not only think about electronic and online security (firewalls, virus and spam filters, internet intrusion attacks, etc.) but also about physical security. Most companies tend to neglect one or the other and sometimes both. In today’s environment the physical as well the data security should be considered a top priority for any IT assessment. The risks are high no matter what business it is, including legal consequences and public embarrassment. At a fortune 500 company where I once had the privilege to work became a victim when half the office noticed that there computers were running slower than usual. Upon further examination it was discovered that each computer was missing half the memory chips that they had. Someone had simply walked in after hours before the lock-down, removed memory, and walked away. At another client site we discovered that they have neatly documented their security policies and key passwords but the passwords for all the accounts were exactly the same! Depending on the industry you work in you may also have to worry about compliance and regulatory issues. For health care industry you have to worry about HIPAA compliance. All personal information and medical records have to be protected according to the guidelines of the HIPAA act. All publicly traded companies have to be in compliance with Sarbanes-Oxley act (SOX). Even though the SOX act never mentions the word software the audit trails and record keeping required by the act ensures sizeable investment in IT infrastructure and processes to manage it. There are various other acts and standards like the Patriot act, DOD 5015.2, SEC regulations, ISO standards (9000, 15489), etc. that may apply based on the industry and business practices. Sometimes the process may be even more confusing and harder when acquiring companies in different countries or different states where the local laws are not the same. All of this means that you must ensure that your new acquisition does not expose you to compliance issues that you didn’t have to worry about before. How do we plan for the joint future? Now that you have good handle on what you just acquired you need to plan how you are going to move forward. You need to think about cost saving opportunities by consolidating sites, hardware, and other resources. You need to think about standardization of software, hardware, and operational practices. You will have to decide how want to handle common branding and identification issues such as email domain names, website, central call-in numbers, etc. You will need to examine what support contracts and license agreements exist and how they need to be modified as part of the larger organization. The integration with the umbrella organization needs to phased in and timing needs to be planned carefully to minimize impact to the business. A combined successful and seamless existence doesn’t happen on its own it needs to be planned and carefully executed. If your company is planning to grow through acquisitions you may want to create a process for assessing and integrating new acquisitions based on your current experience. If the business you are acquiring is being carved out of a larger parent company, you also need to plan for a migration plan off of the services that the parent company is offering during the transition period. There are further complications if you intend for your new acquisition to be platform company to which you will add other newly-acquired companies over time. Up until few years ago most companies were satisfied with creating websites that were largely static. A website designer would organize largely pre-existing content into a collection of content buckets, slick graphics, and flash presentations and a website developer would bring the website into existence. New content would be added when either the old one became obsolete or new products or services were created. This model is essentially one step above the electronic brochure style websites of yesteryear, when companies essentially copied their existing paper brochures to web and called it a website. In today’s environment of social networking, blogs, and collaboration, static content is not only passé it prevents companies from driving advantage from their internal and external user bases and communities of experts. Fresh and timely content helps drive new traffic to the website and is an effective marketing tool. Unfortunately, most companies do not realize the need for fresh and rapidly evolving content on their website and the role it can play in engaging their customers and prospects. Even companies whose products and services remain largely stable overtime need to think about their websites differently. It is not just a one way medium to push static content outwards, it is in fact one of the most cost-effective mechanisms to engage customers and prospects and turn them into a long-term asset. If you believe that the nature of your business is such that you don’t need to think about using your website to engage your customers and prospects, chances are you haven’t fully explored the possibilities. It may take some effort to figure out creative and effective mechanisms to drive advantage from your ability to create fresh and meaningful content and interactions with your customers and prospects, but the rewards are well worth it. From local doctor’s offices to insurance companies to Fortune 500 companies, all can benefit from large, loyal, and engaged communities of customers and prospects. However, most likely your existing static content-based website can’t support the type of content and interactions needed to support what we just discussed. If your website infrastructure still relies on IT staff to update the content chances are you won’t be able to morph your website into a hub of fresh and dynamic content that attracts new and repeat visits. The business users or the content creators must be able to update the content easily and as frequently as needed. Discussion forums and blogs can be used to create vibrant user and expert communities that revolve around your products and services and continuously create new content that keeps customers and prospects coming back to your site. These tools not only provide a mechanism for external parties to contribute new content but also provide a mechanism for them to communicate directly with you about what is important to them. Insights gleaned from such content can be quite valuable in creating new products and services or improving the existing ones. Now that we’ve talked about the virtues of fresh content and using your website as a two way medium, you are probably wondering if you would be able to afford it. A little known secret about good WCMs is how cost effective they can be. Creating a custom website from scratch can be a very onerous and expansive proposition. However, most well respected WCMs offer out-of-box templates and web components that actually make is much faster and cheaper to build a website if you take advantage of their off-the-shelf goodies. If you are considering investing in an upgrade of your website — even if you are NOT (consider the cost of lost opportunity) investing any money in your website — it would behoove you to look at the benefits of upgrading your website using a WCM system. The aim of this three part series is to gain insight into the capabilities of cloud computing, some of the major vendors involved, and assessment of their offerings. This series will help you assess whether cloud computing makes sense for your organization today and how it can help or hurt you. The first part focuses on defining cloud computing and its various flavors, the second part focuses on offerings from some of the major players, and the third part talks about how it can be used today and possible future directions. Among these categories SaaS is the most well known, since it has been around for a while, and enjoys a well established reputation as a solid way of providing enterprise quality business software and services. Well known examples include: SalesForce.com, Google Apps, SAP, etc. HaaS is the older term used to describe IaaS and is typically considered synonymous with IaaS. Compared to SaaS, PaaS and IaaS are relatively new, less understood, and less used today. In this series we will mostly focus on PaaS on IaaS as the up and coming forms of cloud computing for the enterprise. The aim of IaaS is to abstract away the hardware (network, servers, etc.) and allow applications to run virtual instances of servers without ever touching a piece of hardware. PaaS takes the abstraction further eliminates the need to worry about the operating system and other foundational software. If the aim of virtualization is to make a single large computer appear as multiple small dedicated computers, one of the aims of PaaS is to make multiple computers appear as one and make it simple to scale from a single server to many. PaaS aims to abstract away the complexity of the platform and allow your application to automatically scale as the load grows without worrying about adding more servers, disks, or bandwidth. PaaS presents significant benefits for companies that are poised for aggressive organic growth or growth by acquisition. So which category/abstraction level (IaaS, Paas, SaaS) of the cloud is right for you? The answer to this question depends on many factors such as: what kind of applications your organization runs on (proprietary vs. commodity), the development stage of these applications (legacy vs. newly developed), time and cost of deployment (immediate/low, long/high), scalability requirements (low vs. high), and vendor lock-in (low vs. high). PaaS is highly suited for applications that inherently have seasonal or highly variable demand and thus require high degree of scalability. However, PaaS may require a major rewrite or redesign of the application to fit the vendor’s framework and as a result it may cost more and cause vendor lock-in. IaaS is great if your application’s scalability needs are predictable and can be fully satisfied with a single instance. SaaS has been a tried and true way of getting access to software and services that follow industry standards. If you are looking for a good CRM, HR management, or leads management system, etc. your best bet is to go with a SaaS vendor. The relative strengths and weaknesses of these categories are summarized in the following table.